Definition: Serendipity means a “happy accident” or “pleasant surprise”; the finding of something good or useful without looking for it. Ah….the healing attributes of a road trip. We didn’t know ahead of time how much good it would do us, nor the pleasant surprise ending to come……we only needed to escape the house. 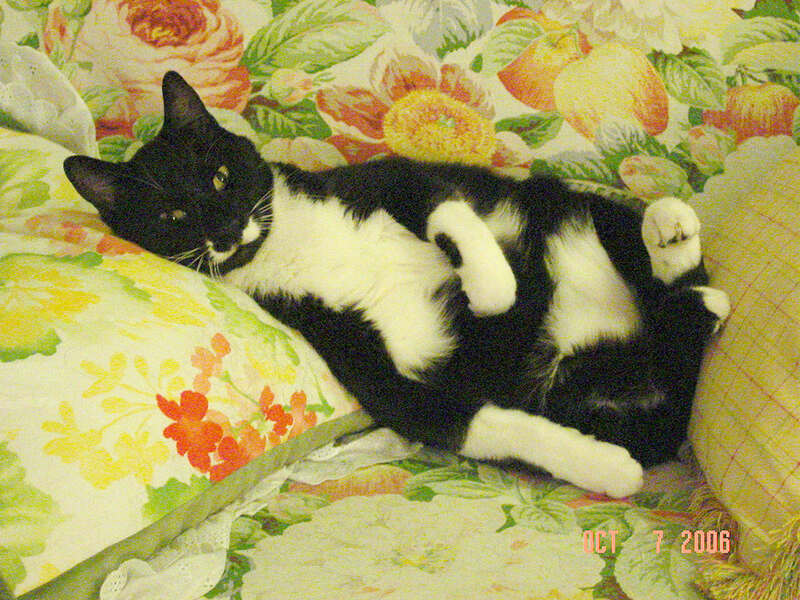 We had just lost our 16yr old cat, Tuxedo, and our hearts were grieving. What better time for the welcome distraction of a road trip? 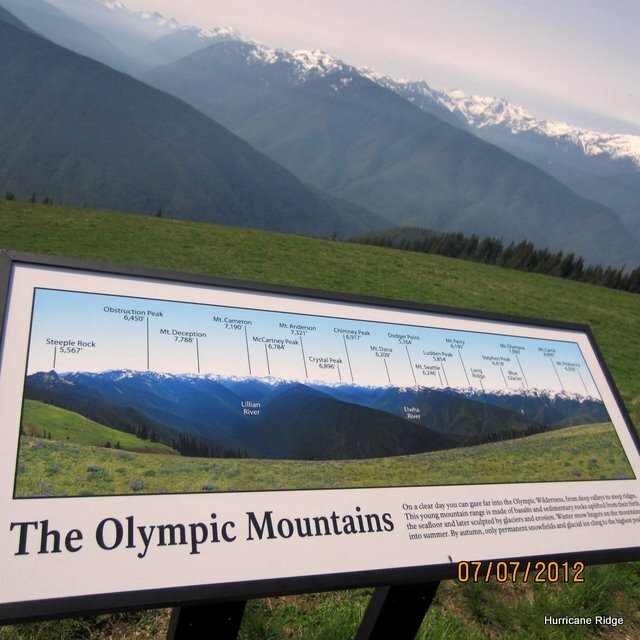 Olympic National Park was on the agenda because there you can ~ even in a short visit~ see ecosystems varying from the alpine, to rain forest, to beach. We saw each over 3 days. Day 1: The long drive from Oregon home to Washington’s Hurricane Ridge : a hugely popular mountaintop tourist attraction and justifiably so. Stunning views of snow-capped mountain range / alpine meadows in bloom / black-tailed deer a bit too accustomed to human presence because you could photograph them from 10′ away as they grazed, unperturbed. Despite being dressed for balmy weather, we could cross the parking lot to a large patch of snow. How about a snowball fight in July? Isn’t that a grand way to beat the heat? 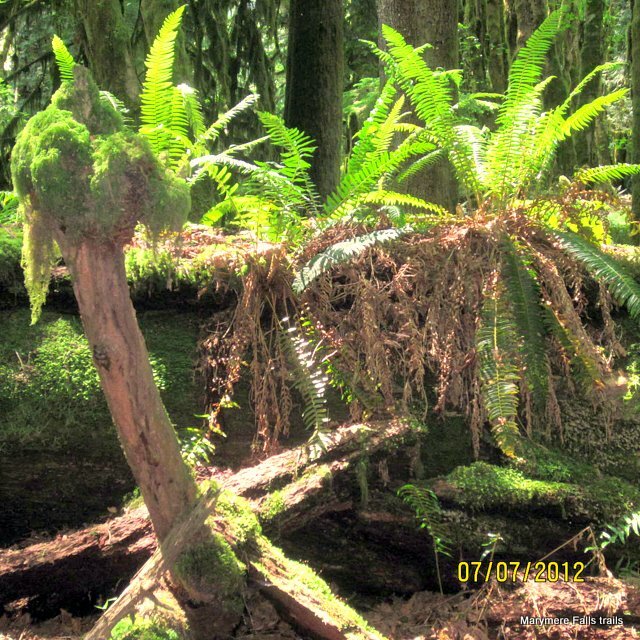 Day 2: Marymere Falls, then nearby Hoh Rain Forest. Between the two, I favored Marymere, with it’s towering trees above and an abundance of primeval ferns crowding the ground trails below. Layered between were branches draped in curtains of moss. You almost expect a dinosaur to appear at any moment. Instead, birds flit everywhere filling the air with their high twittering calls. 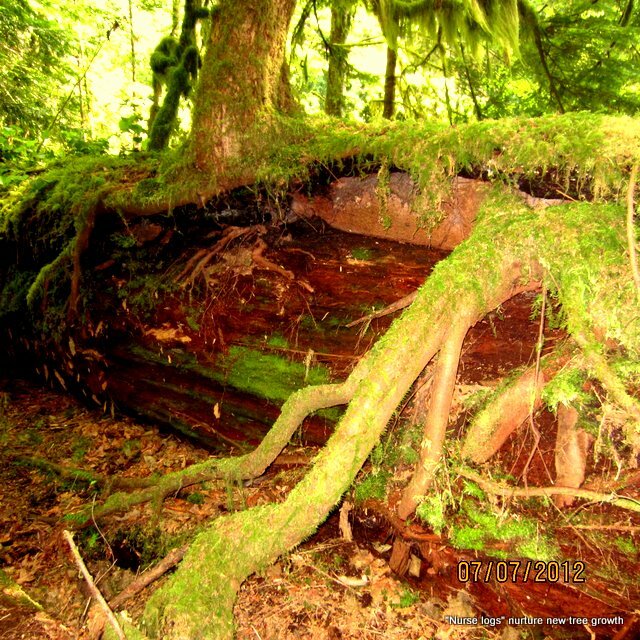 So much opportunities for great photos of textured broken logs hosting colonies of moss / tiny ferns /colorful shelf fungus / and tangles of younger tree roots wandering over the side of fallen logs to reach the ground for nourishment. 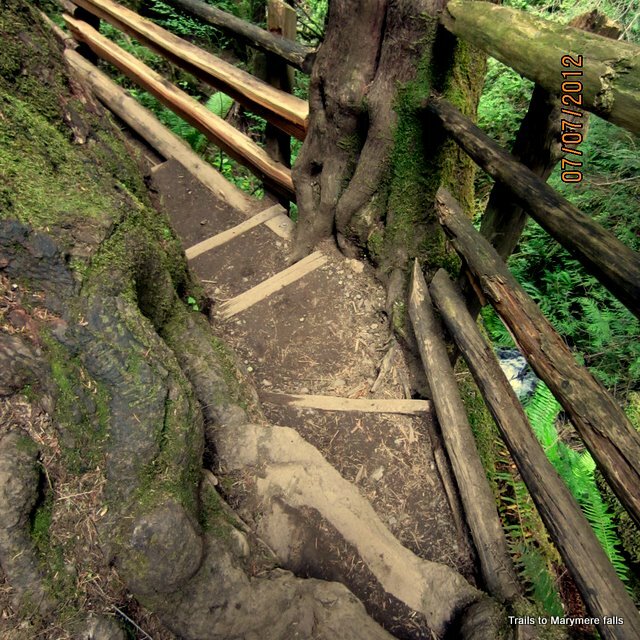 What a lovely forest trail to meander along….oops I mean hike. It was a few hours of hiking. Nothing too arduous, just plenty of walking + mildly steep stair treads of mainly tree roots. In fact, I was hard put to take it all in: the tall tree canopy / the hanging moss / the occasional view thru tree trunks to a flowered meadow / and simultaneously watch I didn’t trip over bulky tree roots along the trail. I got queasy from looking up / down / around / and up again. Well, that was me after self-medicating with chocolate-covered coffee beans! Ya do what ya gotta do. Not a typically sandy beach, instead this was every size of round pebbles and strewn with eons of tree debris. What look like extra tall islands are called Rock Stacks. Capped on top with a replica of the rainforest from what I could see: tall trees / ferns / moss / and lots of greenery. 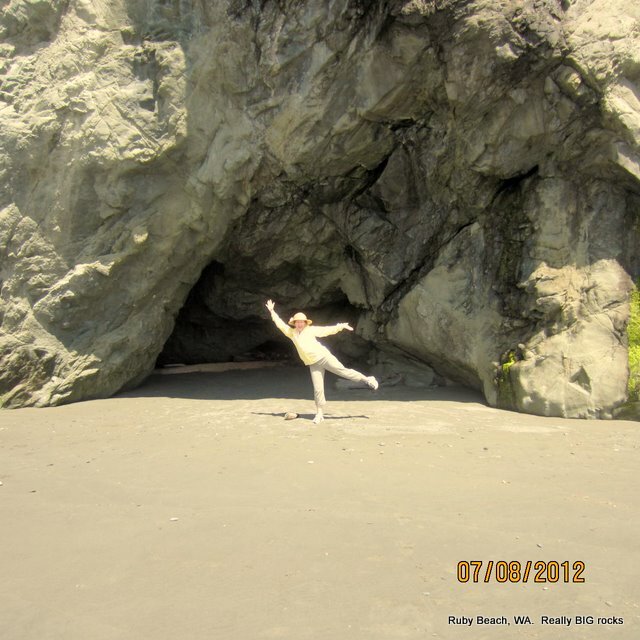 Signs say sea birds nest there annually. It was a healing getaway. All the more so for being happily topped off by serendipity when suddenly encountered friends. Talk about a small world! We had paused for a break to stretch our legs in the little town of Port Angelas. 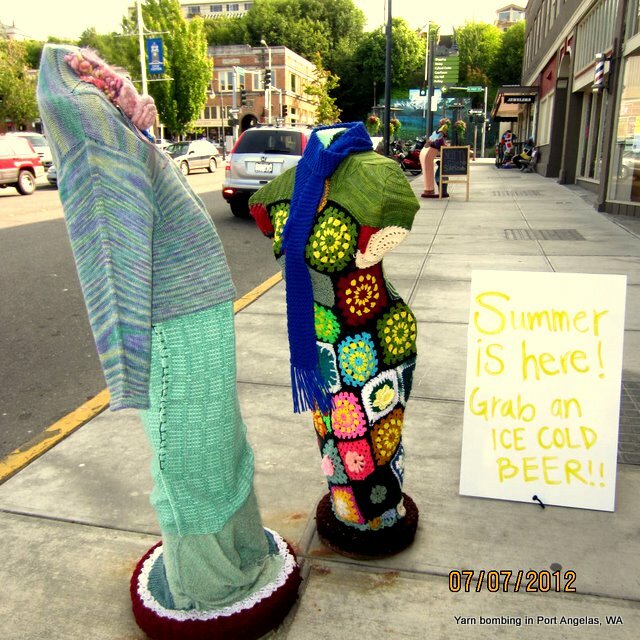 Just as I muttered there ought to be a yarn store somewhere, we spotted sidewalk sculptures covered in knit & crochet! They’d been yarn-bombed! It was the first time I’d see Yarn Bombing in person! What fun! Then look honey…. a yarn shop too ….and we wandered into The Cabled Fiber Studio…..
….to suddenly be greeted with delighted little shrieks from owner MarySue French, whom we’d met at previous shows. “You came all the way to see us!” I couldn’t have been more pleasantly surprised to see her familiar face….and we shared a good laugh over the unanticipated chance meeting. I glanced over shoulder to alert dear husband, and found myself looking right at Susan of Abstract Fiber, there to give a trunk show. What were the chances of meeting her so far from home? (she’s in my Aurora Colony Handspinners Guild) I almost blurted “how did you get into my road trip?” Hugs and laughter / a trunk show / a beautifully stocked yarn store / happy conversation / dinner together and a good time among friends. What a terrific road trip. 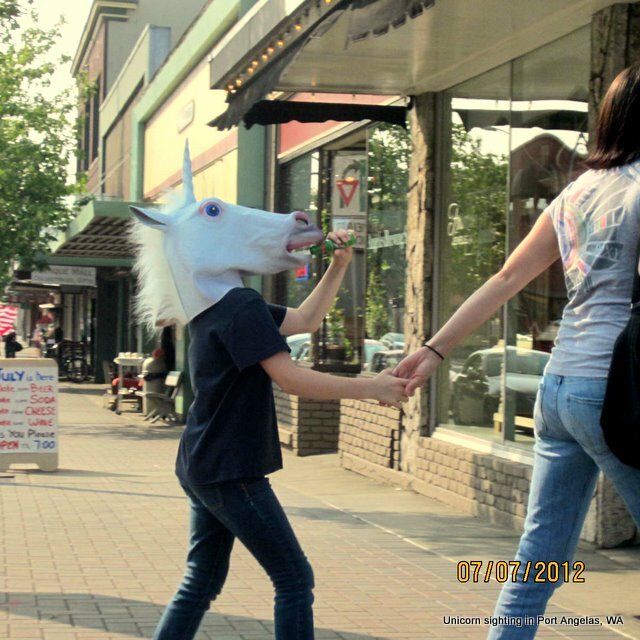 AND we had a Unicorn sighting! Home again and our hearts feel lightened. Now we can smile to recall dear Tuxedo-kitty with happier hearts and laughing memories. What a memorable road trip. And all those beautiful lichen – colors to remember for dying. You know…I actually did consider those lichens & mosses for dyeing. It’s just I’d feel too guilty picking them within a National Park, so I restrained myself. Also couldn’t help thinking how a certain member of my Aurora Colony Handspinners Guild would have loved to get her hands on some of the many mushrooms & fungi too, which she craves for dyeing fiber. 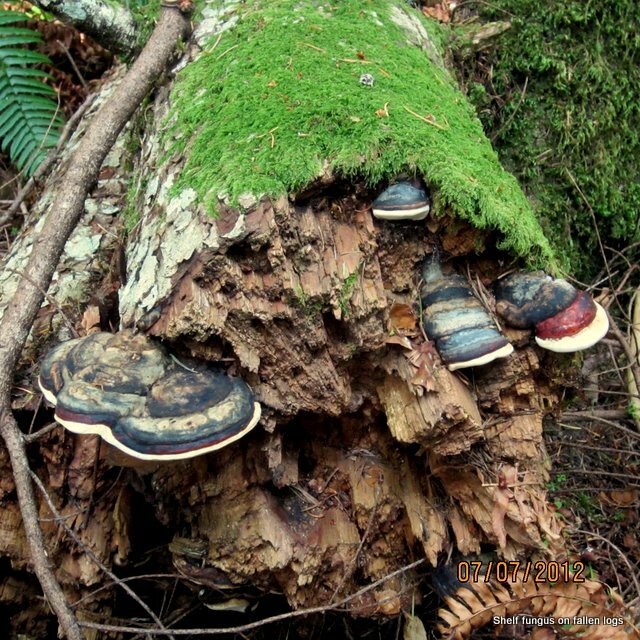 We saw sooo many fungi everywhere. The thought of picking them & dyeing made me wonder if any have toxins which could absorb thru skin when picked, or from the water when dyeing. I just want the pretty yarn colors, I don’t wanna ‘trip out’ on imaginary colors!